When dc voltage is applied to the armature of a dc motor with its field excited by dc, a torque is developed and the armature rotates. It accelerates to a speed at which the emf induced in the armature conductors balances the applied voltage and the following DC Motor Basic Machine Equation is satisfied. Ka is called armature constant of the DC Motor Basic Machine Equation. In a separately excited motor Φ can be assumed to be constant at a given field current when armature reaction is neglected or compensated. From eq. 4.27 it is clear that the speed of a DC Motor Basic Machine Equation can be varied by changing the value of (Va-Iara). 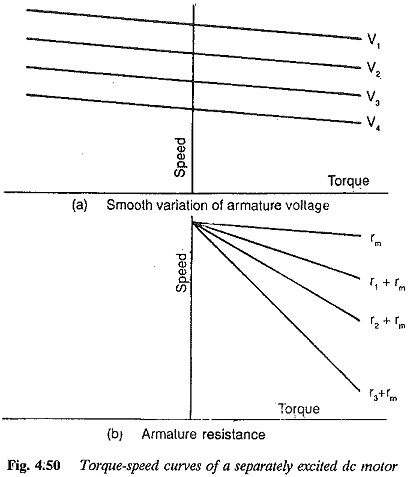 1.By varying the value of applied voltage to the armature, as is done in Ward Leonard system (Fig. 4.48). 2.By inserting an extra resistance in series with the armature (Fig. 4.49). In the former, a variable voltage supply is required. The operation is loss free and efficient. 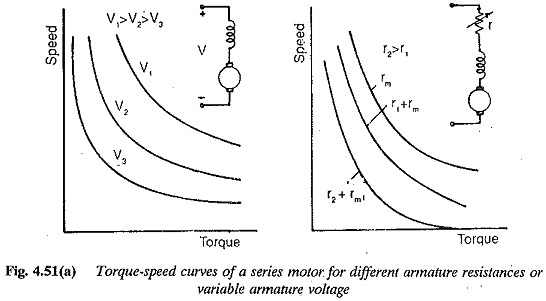 The torque versus speed characteristic is shown in Fig. 4.50. In the latter, extra resistance inserted involves extra losses and the motor becomes less efficient. 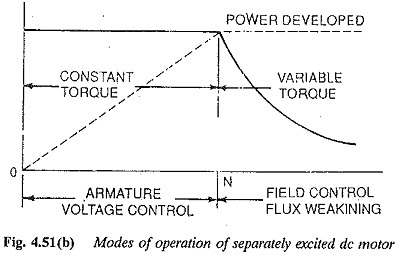 The speed-torque characteristic is shown in Fig. 4.51. In both the cases very small speeds up to zero speed are possible. The motor operates at constant torque from zero to base speed. 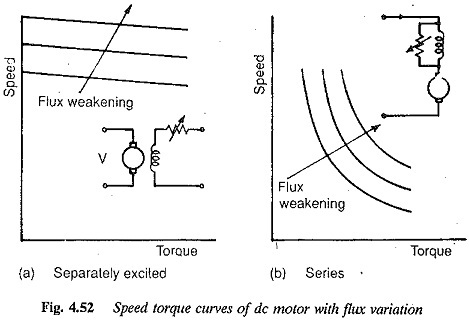 The speed of a DC Motor Basic Machine Equation is also varied by variation of field flux. Speeds above base speeds are possible in this method of control. This method is suitable for variable torque loads. 1.The motor can be accelerated at constant torque (constant armature current) by suitably adjusting the field of the motor. 2.The regenerative braking of the motor is possible and the motor can be brought to rest very fast. 3.Four quadrant operation of the motor is straightforward. 4.The capital cost is more, as an extra M G set is required. The advent of thyristors and the development of power converters using thyristors has made the speed control of electric motors easier and more straightforward. 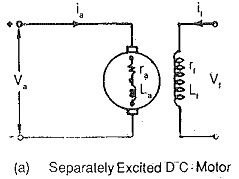 Phase controlled rectifiers provide a variable dc voltage to the armature of a DC Motor Basic Machine Equation (Fig. 4.53). These converters can also operate as inverters, in which case regenerative braking of the dc motor is possible. By suitable connection of these converters, a reversible drive allowing motoring and regeneration in both the directions of rotation is possible. These convert­ers are more flexible, have a faster response and occupy less space. 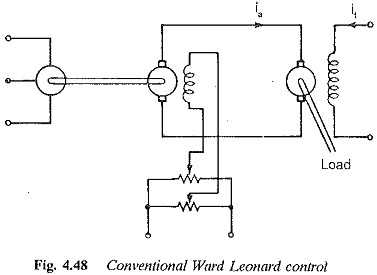 A static Ward Leonard system can be made possible using these converters. However, there are certain drawbacks, such as poor power factor on the ac side due to lagging current, non-sinusoidal input current having rich harmonic content, etc. The load voltage is superimposed by a ripple content. The load current also has a ripple making the ratios of peak to average current and rms to aver­age current greater than one. A large inductance is required on the load side to smoothen the current. Sometimes the load current is discontinuous, which reduces the performance. The ripple content affects the motor heating and commutation. Therefore it is necessary to develop the rectifier which provides a supply to the motor causing only very little variations in the performance as compared to a normal dc supply. Sometimes the DC Motor Basic Machine Equation design is modified so that it can be used on any converter. 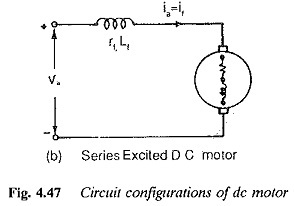 A DC Motor Basic Machine Equation on normal dc supply requires a starting resistor to limit the starting current. When fed from a thyristor converter the starting resistance can be dispensed with and soft starting is possible. The motor can be acceler­ated at constant torque. The dc chopper can be interposed between dc mains of fixed voltage and the dc motor provide a variable voltage to the motor to control the speed. Regeneration is possible in this case also. A static Ward Leonard scheme is possible for two and four-quadrant operation. The output voltage of the chopper is in the form of pulses. The time ratio of the chopper can be controlled to vary the average voltage. The output current varies exponentially during TON and TOFF of the chopper. The output current varies between two limits. There is a possibility of discontinuous conduction if the ripple is more and the load current is small. The chopper can also be controlled with specified current limits, the method being known as current limit control. This fixes the chopper frequency. The ripple content can be limited by proper choice of the limits. The current limit control is less prone to discontinuous conduction. The increased chopper frequency introduces losses. Soft starting and acceleration are possible. Since the battery is supplying the power the problenis of harmonic content and power factor are absent. The performance of a DC Motor Basic Machine Equation when operating on phase controlled con­verters or dc choppers differs very much from the performance when operating on a normal dc supply. The ripple content of the load current affects the mo­tor performance, whereas the harmonics and poor power factor affect the line performance. An understanding of the behaviour helps in improving either the converter or motor design, to achieve better performance.